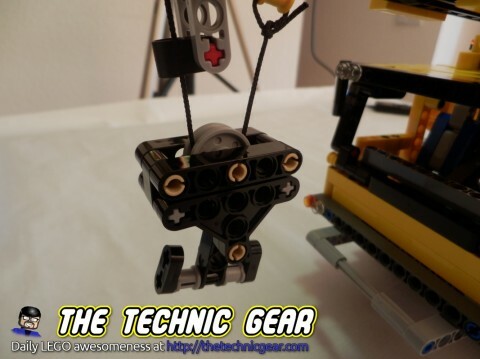 The LEGO 42009 Mobile Crane MKII is the biggest LEGO Technic set ever released, with more than 2,500 parts that will keep you building for several hours. 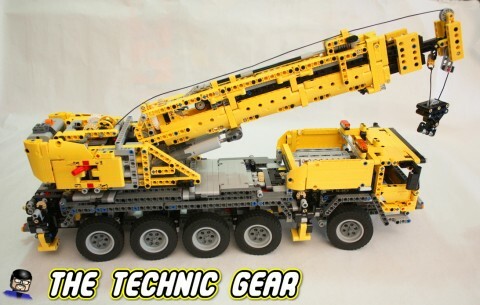 If you like yellow parts then there is no better set to buy that this awesome crane. 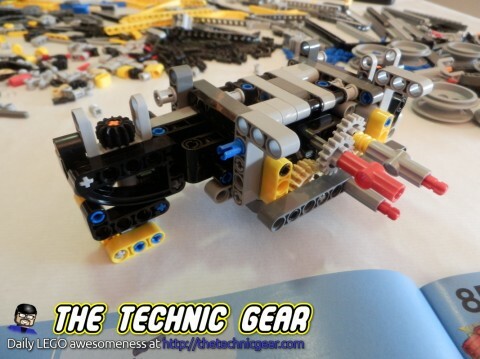 Here I am with the review of the coolest, biggest LEGO Technic set so far. 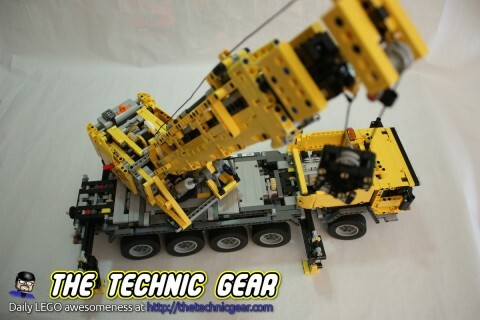 With over 2500 parts the LEGO Technic 42009 Mobile Crane is one of the craziest LEGO Technic models ever. One of the things that really put me back about this model was the price. 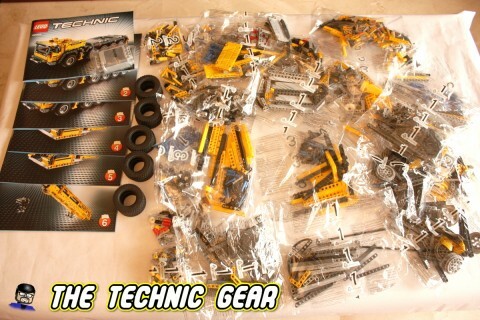 Being the biggest Technic set also turns it into one of the most expensive. Fortunately, I got an offer I couldn’t refuse from Amazon and got it for barely £110. So let’s review it. And let me say first that this model is huge. Features LEGO Power Functions motor-powered extending outriggers, lowering feet, extending or raising crane arm and retractable winch. 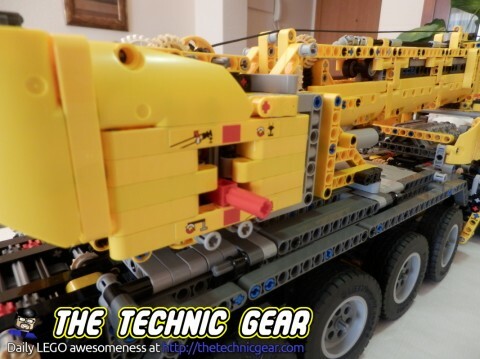 Also includes a rotating superstructure, 8-wheel drive, 5 axles, 10 wheels and a detailed V8 motor with moving pistons, 8882 LEGO Power Functions XL-Motor and 8881 LEGO Power Functions Battery Box. 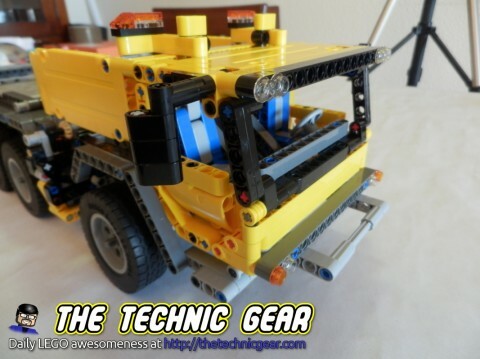 As with the Unimog and the 4×4 Crawler this model features a huge box that can be open on its front part to reveal details of the model. On the back side of the box you can see the Model B and some of its features. I am not sure which looks coolest. Really, as soon as I complete this review I will take apart the model and start building the B model. In contrast to some of the huge box models, this Mobile Crane really fills the whole box. It would have been hard to put all the parts inside of a smaller box. Six, six good instructions manuals. And yes, they are not small booklets with a few pages. 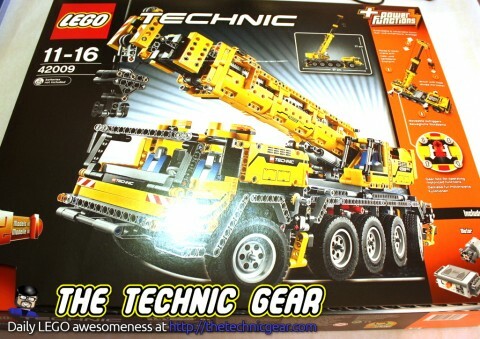 All of them has around 70-80 pages and at least split building the crane in three logical steps: mobile crane truck, crane body and crane arm. It would have been hard to do it in less steps. So, building experience. 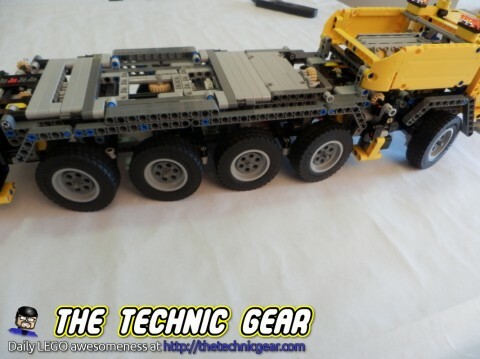 When they say that this is LEGO Technic biggest model, they really mean it. The building experience is awesome but really expect a few days of building. It took me around eight hours of building time to get the model done plus a few hours to fix a mistake I did when building one of the most inner gearboxes. On other models I have built I have found simple to test the model so far to search for mistakes but really on the mobile crane I tried and I wasn’t sure if it was supposed to work or not as it was doing. The crane truck is really cool with two features that stand over the rest: the 10 working wheels with a steering system for such number of wheels and the stabilization system with four small linear actuators that emerges from the sides of the crane to make it stabler when operating the crane. The crane body has another complex gear box as well as two big linear actuators that operates the crane arm. Also this part includes the battery and the L-motor that operate the whole set. Finally, the crane arm features a winch and a greatly designed extensible arm. So let’s review the main features. A four-wheels vehicle turns by just steering their front wheels a given angle but unfortunately that approach doesn’t work when you have more than four wheels. As this mobile crane has 10 wheels you need to create a way of steering wheel that maintain them in the steering angle needed for each of them. You can see it on this diagram to better understand the problem. Really LEGO people have done a great work creating the system, so great that I didn’t even realized I was building it. The steering is very precise ans smooth for such big model. In fact the Unimog was harder to steer than this. This part features one of the longest axles I have ever seen, a 32L axle. It is so large that it is hard to keep it straight. It goes from the back of the truck to the front part so that the stabilization system opens as one. It operates in two stages. First it exits from the truck body at four points: two on the front and two on the back. 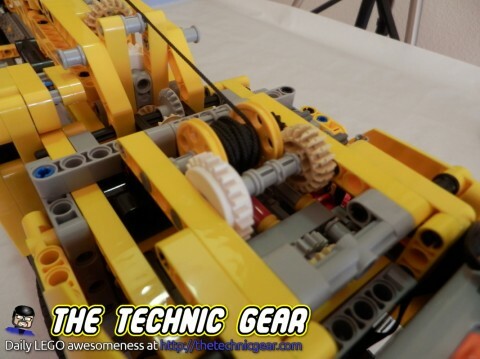 Then, when it is completely deployed you can switch the clutch and it will start working on the linear actuators to actually land the system feet so it keep the crane completely stable when working. It is a pleasure watching it working, but unfortunately the second part of the system works very very slow. Why?! In my model the feet don’t really take the crane weight. They just reach the floor and stop there. Is that a feature? Looks like it is. The rest of the main body isn’t much interesting although it looks really nice, like the fake V8 motor. The Crane body contains the L-motor that operates the whole system as well as the battery box that it is used as counterweight on the back of the crane body. Unfortunately it isn’t enough when you are rising something that weight over 200g and it makes the crane body to bend forward. Not a nice view trust me. You can rotate the crane body 360º over itself with no problem. 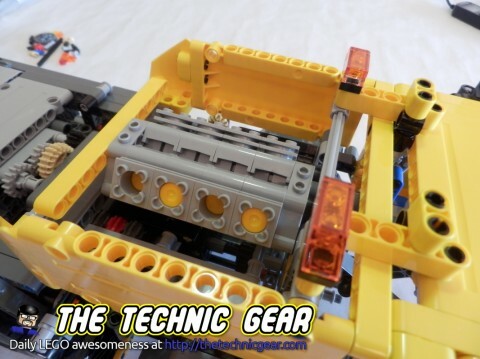 This part also features a gear box to operate four different functions of the model, which is built in a quite interesting way. 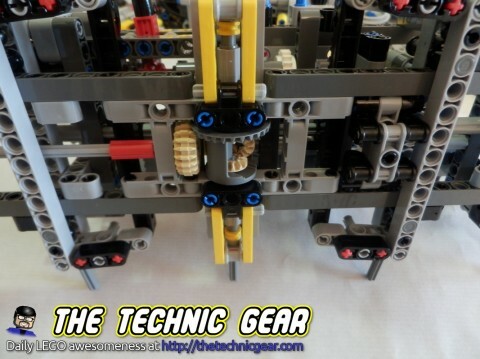 When I first saw the model on LEGO images I thought it was an special part but it is just a few beams and two clutches. Definitively, a great way of doing it. The four functions are operating the lower part of the truck, moving up or down the crane arm, extend it and operate the wrench. 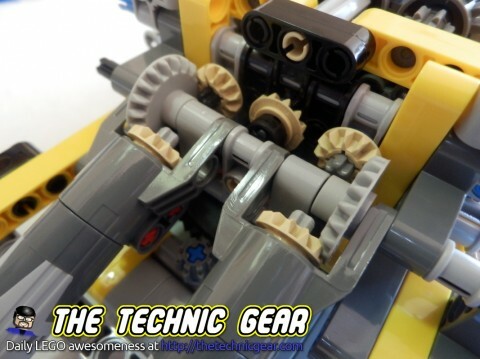 LEGO again got a very cool looking solution using just standard parts. The only problem I see is that they should have added a lead-made part so it weight because when you operate it without anything attached the cable lack of the required tension and can make a mess of itself. Also in my case the wrench tended to turn to one side a bit… Just a bit of extra weight would have solve the problem. This part is quite nice. It is built using mostly stud-parts. I suppose that they had to use them to make the arm as small as possible. When I have been building my own models I have found that some ways of building are a bit hard with studless beams and stud parts really do the work faster. Maybe this is the case too. The arm is raised and lowered using two big linear actuators on the crane body. When it is fully extended it measures well over 60cm but unfortunately it isn’t able to raise a noticeable weight without bending ( you can’t use this crane to repair your house, sorry. ). The arm can be extended using the gearbox on the crane body, but as well as the stabilization system, it is a slow operation. It can take around 40-50 seconds to fully extend the arm. What do I think? What do I think? Run! You fools! Go and buy one! No, seriously. If you can afford the money, it is a great model. It is huge, it is fun to build, it is a challenge and the best part of it is that it works. Absolutely everything in this model is awesome. The only downside I can think of this model is the lack of a remote control to operate it and the fact that it doesn’t move on its own. The extensible arm can’t take much weight. You can buy it at Amazon for £149.99. Although usually it is cheaper. Brilliant review. Ive recently built it and i only found this page when i googled ‘Is there a better model that this ??’. Agree… I love this model. I want to find time ( and will ) to build the model B that looks amazing too.